Photos courtesy of Garrett Carroll and Eric McLaughlin. Above: the Ambitious Ales crew stands in front of their soon-to-be location. 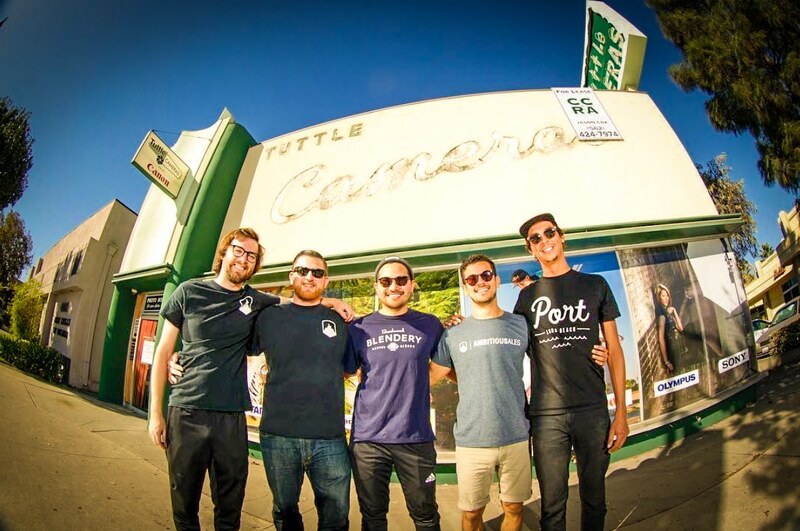 Both Liberation Brewing Company (LBC), taking over the old 98 Cents Store at 3630 Atlantic Ave., and Ambitious Ales, taking over the (already missed) Tuttles Camera space at 4019 Atlantic Ave., are set to open this year. LBC, having just started its official first brewing session on March 22, is looking to open within the coming weeks while Ambitious Ales will be opening later this year—and what each brewery brings is a more beer-centric flavor to Bixby Knolls, joining other existing staples like Rasselbock and Dutch’s BrewHouse. And they bring histories with them that both stemmed out of their living rooms acting as mini-breweries. More than ten years before the craft beer boom, local brewer and LBC owner Eric McLaughlin long held an interest in brewing his own beer and for the past four years, has been developing the idea behind LBC. Having moved to San Francisco for film school, the former Lakewooder-now-Long Beacher [pictured right] was surrounded by NorCal’s vast craft beer scene, from breweries like Russian River and Rogue to beer bars like Toronado and Zeitgeist in the city that served nothing but locally crafted brews. McLaughlin’s talents in home brewing were honed entirely auto-didactically. His love for cooking and flavors—a factor that drives many into both loving beer as a complement to food as well as inspiring one’s inner brewer—drew him toward the idea of creating beer. Reading forum after forum on Beer Advocate, he created his first beer, a Belgian strong dark. In the words of McLaughlin, everything that could go wrong did go wrong: under-pitched yeast, no temperature control on any level, and a complete lack of finesse. Brew after brew, over and over, failure after failure, McLaughlin learned from his mistakes and continued his uphill journey toward being a bona fide brewmaster. After a stint at Ohana Brewing in Los Angeles as brewmaster, he has taken his talents to his community. His driving desire has brought him to Bixby Knolls, where he—along with partners Danny Regan and Mike Clements—are hoping to take his brew skills to the next level with LBC. (Acronym very much intended to represent.) They hope to join Beachwood, the Blendery, Congregation, and Belmont Brewing as astounding examples of locally crafted, independent beer. Above: Eric McLaughlin (right) enters LBC’s brewing facility. Ambitious Ales is seeking no different. Owner Garrett Carroll had spent well over a year in Anaheim searching for a location for Ambitious, only to keep coming up with bad locations or even worse landlords. But with Long Beach’s impressively open approach to catering to new breweries, Carroll and his crew were led to the mighty shores of Long Beach. And after five months of searching, the charming space once occupied by Tuttles lured them in. Above: work on the former Tuttles space continues as Ambitious Ales takes shape. Carroll is unapologetically romantic about what beer is in a community, dubbing it a “social connector and lubricant” while noting that pubs and tap houses were, like the caffeinated morning counterparts that are coffee shops, epicenters for gathering humans. Like LBC, Ambitious stemmed from a home-brew operation back in 2010 after being inspired by experiences in at the beer mecca known as the annual Oregon Brewers Festival. Liberation Brewing Company is located at 3630 Atlantic Ave. and Ambitious Ales is located at 4019 Atlantic Ave.